Number 20, Nick Grignon participating in the Sun Drop Shootout. Photograph courtesy of Lori Sherman. 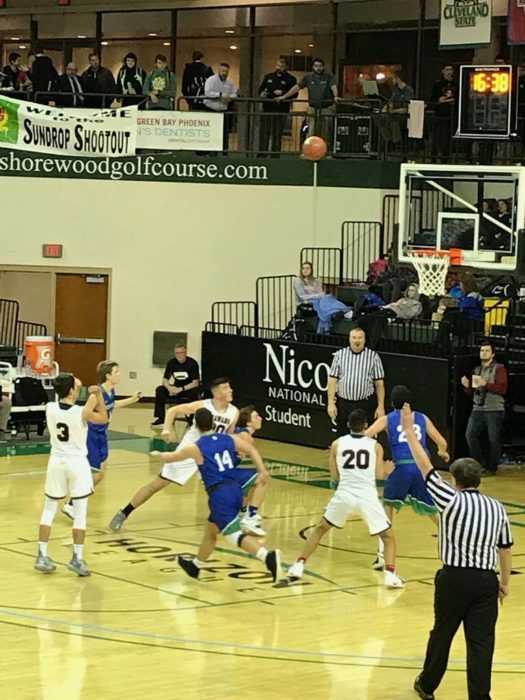 Friday, December 28 and Saturday, December 29 the Shawano Girls and Boys Basketball teams participated in the Sun Drop Shootout where they played against other teams. The Shootout took place at the Kress Center on the campus of the University of Green Bay. The boys basketball team played against Notre Dame Academy ending the tournament with a 59 to 49 win. The girls basketball team faced Slinger and lost 29 to 52 after holding them to halftime. This was the tenth year that Twigs Beverage title sponsored the tournament. Getting the opportunity to play at a premier Division I venue was great for Shawano teams and surrounding teams from the area. 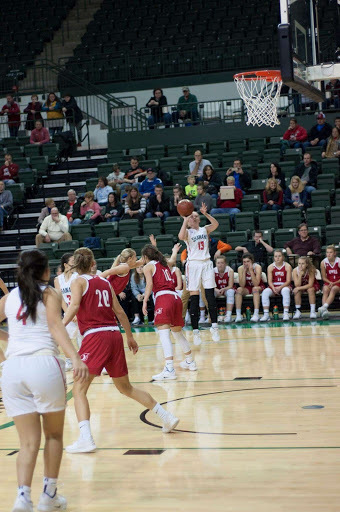 Additionally, it was an excellent showcase for the Kress Center and the University of Green Bay, with high schoolers and their parents visiting in volume. The girls basketball team prepared for this tournament as Ward stated, “We practiced everyday transition drills and to make sure we beat them down the court by playing against one another. The coaches of the girls and boys teams are Ryan Koenig, Dustin Beyer, David Ambrosius and Andrew Brooks. They have led these teams to victory before and coached each to their potential. With practice and the direction of these coaches, Ward scored three points during the shootout and Grignon scored six. “I was really anticipating if we win, we’d beat a ranked team in the state, and that would show that we are capable of doing great things as a team. We did well on defense when doing zone, but we didn’t handle the ball the best or execute the plays,” said Ward. Before any game, the teams have a lot of fun while listening to music as they get ready in the locker room. The boys basketball team also prepared in practice by going over scouting reports of the players they got and what they need to do to stop them. Grignon got ready for the shootout as he put headphones in and ate Sour Patch Kids which is something he does before each game. “The coaches knew we let our game slip in the first half, but they were very satisfied with how we came out the second half and started to play like us again. The best part of the game was the celebration afterward in the locker room. It’s always a nice way to top off the win,” stated Grignon. Both teams played to the best of their abilities despite playing tough teams in a different environment. Each individual on every team knows what they need to improve and are working toward their goals. “If you want to be good at something you have to put the time in at what you want to get good at. If there’s a certain thing you want to be good at, you need to practice it over and over. If you put the time in, you will see results,” stated Grignon. Number 13, Kayla Ward participating in the Sun Drop Shootout. Photograph courtesy of Jody Ward.